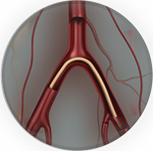 Surgery is another option for the treatment of some varicose veins. This involves being admitted to hospital where the procedure is performed in the operating theatres under a general anaesthetic. Most patients then spend one night in hospital. For long saphenous vein stripping, the procedure involves making an incision in the groin and ligating and dividing this vein at its junction to the common femoral vein. A separate incision is made at or just below the knee and through these two incisions this portion of the vein is removed from the patients' leg. For the short saphenous vein an incision is made behind the knee and the short saphenous veins is ligated and divided at its junction with the popliteal vein. 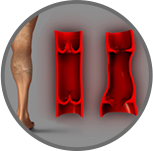 Separate smaller incisions are made over the sites of the varicose veins and bulges where the individual varicose veins are removed (avulsed). 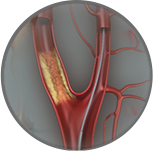 Any perforating veins that need to be treated are also ligated through separate incisions. The groin wound is closed with layers of self absorbable sutures under the skin. Sterri strips are applied to the skin and the leg is bandaged. The procedure usually takes 45mins to one hour on average. The following morning the bandages are removed and a compression stocking applied to the leg. The patient can mobilise and is usually discharged home by 10am the day following the surgery. For patient instructions post varicose vein stripping surgery refer to this form.